Pin it! 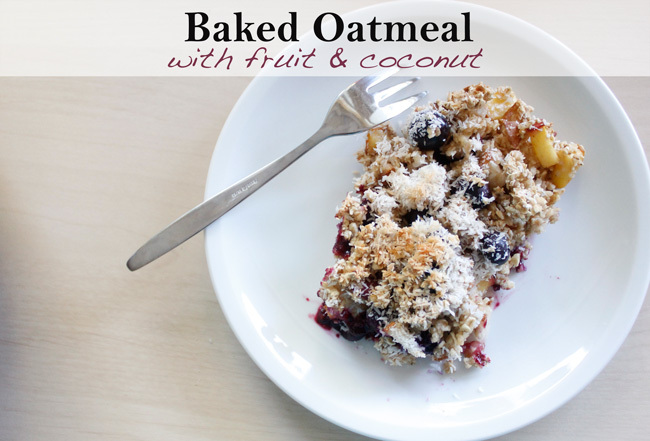 Baked oatmeal with peaches, berries and coconut. This is a dish I make quite often because it's good both hot and cold, and therefore works as a breakfast or snack. It's so customizable, so feel free to put in your favorite fruit if you don't see it here. In the past, I've used bananas to line the bottom of the pan, and mixed in raspberries, fresh strawberries, and even pears. This time around I used peaches and berries, and it was just as good. Preheat the oven to 350f. Combine oats, fruit, flaxseed, cinnamon, sweetener and water in a large bowl. Mix well - the goal is to have no dry oats. You can add more water if you need to, but you don't want them soggy. Put the mixture in a cake pan and even out the layer. Add the coconut on top. Bake 40-45 minutes, or until the coconut flakes are lightly browned. Eat and enjoy! PS- Pumpkin pancakes, and a healthier dessert to welcome in fall. PPS- The recipes page got a bit of a makeover!